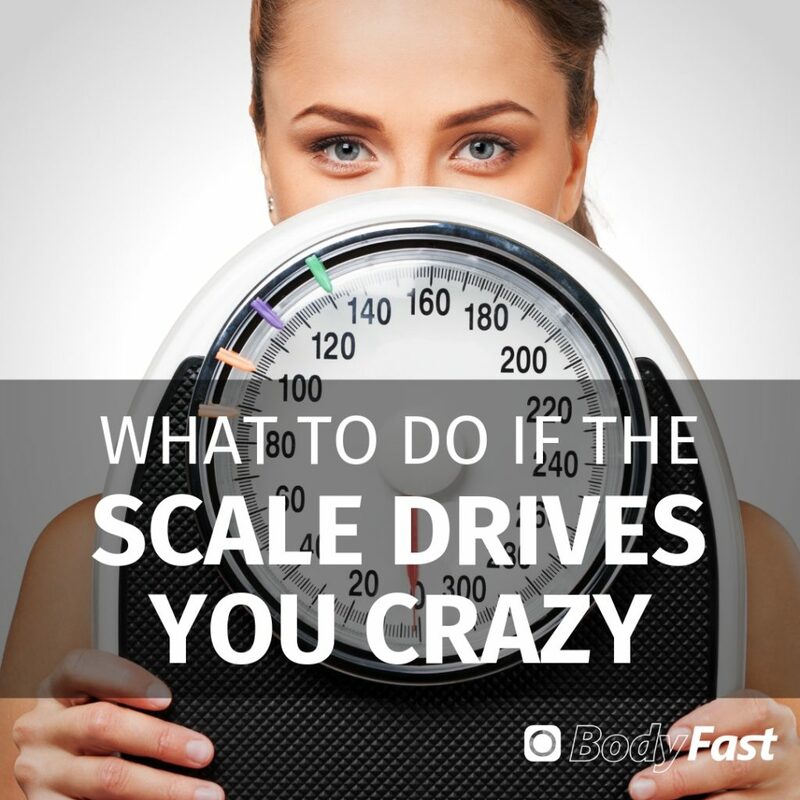 What to do if your scale drives you crazy while doing intermittent fasting - the intermittent fasting app. Lose weight fast and easy, get healthy without a diet. …You have just started your program. You were really motivated and pushed yourself through your first fasting week. And then you stepped on the scale and thought „Oh noooo“. … Or you are already a little longer in the fasting game, you started off with some great results, it went really well and then you recognized that you don’t lose weight anymore. These are two typical scenarios of people who do bodyfasting. Did you experience something like this? We tell you: Just take a deep breath. This doesn’t mean anything at all, neither that intermittent fasting doesn’t make sense nor it doesn’t work for you. The body usually needs some time in order to adapt to intermittent fasting. Sometimes it takes more than two weeks or even longer until you can measure your first results. Maybe you don’t like to hear that but patience is key. So what is your first strategy if you recognize that your scale doesn’t show the results you hoped for? Your body weight is just an indicator for your body and shape but nothing more. Your self esteem and self image shouldn’t depend on one number, don’t you think? You are so so much more than this. And first and foremost you are on your way to do it differently this time, right? Drop your diet mindset now! So, if you step on the scale, be aware that your scale shows exactly ONE thing: A number. It is important to weigh yourself at the same time and/or under the same conditions. Even one meal more during the day can have a massive impact on the scale and therefore can lead to unnecessary frustration. In addition to that women have usually a hard time during their menstrual cycle because of water retention in the body. This is completely normal. This means that fluctuations in weight are not the proof that something isn’t working! It means exactly the opposite! Your body relies on a dynamic process, imagine a wave with a tendency down. This is how the body works. So relax and take care about the time and situation when you weigh yourself! If you feel stressed out every time you step on the scale, then reduce the number of weigh-ins to a minimum. The ongoing stress can lead up to a rebellion of your body against you and can stop the metabolism due to stress hormone issues. Our tip: Make your life easier, not harder. Weigh yourself weekly not daily and improve your stress management right away – with a different awareness if you step on the scale. WHAT TO DO IF THE SCALES LIES TO YOU? If your scale doesn’t show any change, there are many possible reasons. Maybe your body composition is changing and you are getting more muscles. Many bodyfasters tell us that the weight on the scale doesn’t change, but their clothes fit so much better, they can feel it and see it in the mirror as well. The take home message here: The body weight is only one way to track your success. ARE THERE OTHER WAYS TO MEASURE? Well, a lot of scales can also measure your body fast percentage. This is a good addition, but the possibility of wrong data because of the measurement method of the scale can be a big problem here. Only a few high priced scales are able to produce valid results. So be aware of that! Another idea is to take measurements of your body at different areas to track changes in circumference. Have you done this in the past? This is a great way to measure success, sometimes it’s even more accurate than the numbers of the scale. 📏The requirements: You have to know where and how to measure. WE ARE WORKING ON IT, RIGHT NOW! We are already working on a feature which allows you to collect data of your circumferences at different body parts to record your successes! We will also show you, how to take the measurements in a way that the numbers are reliable. We believe this is the best way to track your progress and look forward to presenting this feature to you very soon! You don`t have the BodyFast app?